The largest mountain range in Serbia, Kopaonik extends from the northwest to the southeast for 80 km, and has a width of around 40 km in the middle. The highest section of Kopaonik is the spacious Ravni Kopaonik plateau around which rise Suvo Rudiste and Pancicev Vrh (the highest peak at 2017 m). Kopaonik gained its name from the Serbian word „kopati“ which means ‘to dig’ because of the rich ore resources which were mined here for centuries. Volcanic activity and the discharge of hot mineral solutions caused changes in the surrounding rocks, creating the rich Kopaonik mining region from which iron, lead and zinc were excavated. Due to its valuable ecosystem, Kopaonik became a national park in 1981. Kopaonik National Park covers an area of 11,810 hectares and based on the number of endemic species, it is one of Serbia’s most important biodiversity hotspots for endemic flora. Kopaonik’s important endemic and rare species include the Kopaonik houseleek (Sempervivum kopaonikensis), the Kopaonik violet (Viola kopaonikensis), Panciceva rezuha (Cardamine pancicii), Serbian flax, Pancicev vijuk and eidelweiss. Kopaonik’s rich variety of animal species deserve special attention, of which the Golden Eagle, Peregrine Falcon, Tawny Owl, Shore Lark, Common Crossbill, Eagle-Owl, dormouse, wildcat, fallow deer, amongst others, stand out. Kopaonik lends itself to active relaxation throughout the year and is the largest and best-known Serbian ski centre. The Ravni Kopaonik plateau is centred around tourism, with a wide range of accommodation and a network of ski slopes amongst other facilities. 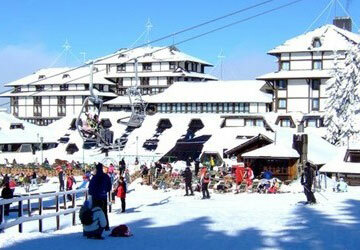 Another tourist hotspot is located near the village of Brzeća, on the eastern slope of Kopaonik. The first class ski slopes lie between 1650 m and 2017 m above sea-level. This tourist resort has a network of 22 ski-lifts connected in one system and 4 children’s lifts, and caters for all types of skiers. The ski-lift system covers a length of 17,222 m and the ski slopes total 44 km in length. The system can handle 13,520 skiers an hour. Guests also have the use of a 20 km-slope for Nordic skiing, and in Crvene Bare there are marked slopes of 3, 5 and 10 km in length. 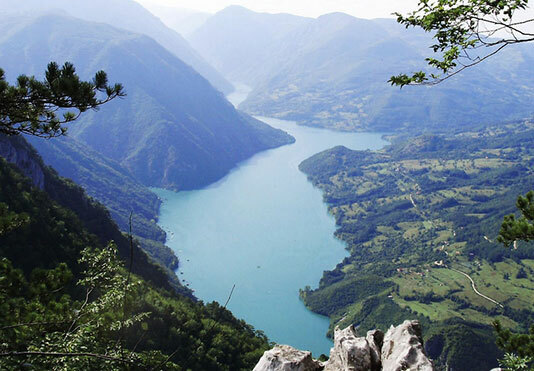 Ski hire and repair services are also available, as well as snowmobile hire. Walking excursions (to the Metodja spring and Semetesko Jezero lake), mountain biking and basketball, tennis, riding and English language schools also take place on Kopaonik. A diverse range of children’s programmes, as well as slimming and fitness programmes, are offered here and there are a great many sport grounds, which are ideal for sports team training camps. The jagged landscape of Kopaonik is ideal for paragliding. The Josanicka, Lukovska and Kuršumlijska (at the foot of Kopaonik) spas are very close to Kopaonik, while the rich thermal springs of the Vrnjacka, Mataruska and Sijarinska spas are just a little further away. Kopaonik, too, has mineral springs: the lightly radioactive Krcmar spring, which is 1700 m above sea-level, and Marine Vode (1950 m).